Folkloracle was founded by Dawn Frary (that’s me), a photographer, Death Doula, and wildlife educator based in Iowa City, Iowa. I’ve studied tarot for over twenty years and seek to make it accessible to everyone, regardless of spiritual or religious beliefs. My goal is for clients to come away from a reading feeling empowered and illuminated, that they move forward with confidence and an unshakable belief in themselves. I firmly believe anyone can tap into the symbolism and archetypal energies of the tarot to enhance their understanding of the world while remaining rooted in reality. Since 2006 I have served as a wildlife rehabilitator and educator, specializing in birds of prey like owls, hawks, falcons, and vultures. My work with wildlife led me to become certified as a Reiki Master Teacher in 2009. In the summer of 2018, I embarked on an 8-week tarot intensive with Lindsay Mack, founder of Tarot for the Wild Soul, to deepen and expand my practice. Also in the summer of 2018 I trained as a Death Midwife (or Death Doula) under Rev. Angela Buchanan of Earth Traditions, a pagan ministry based in Illinois. 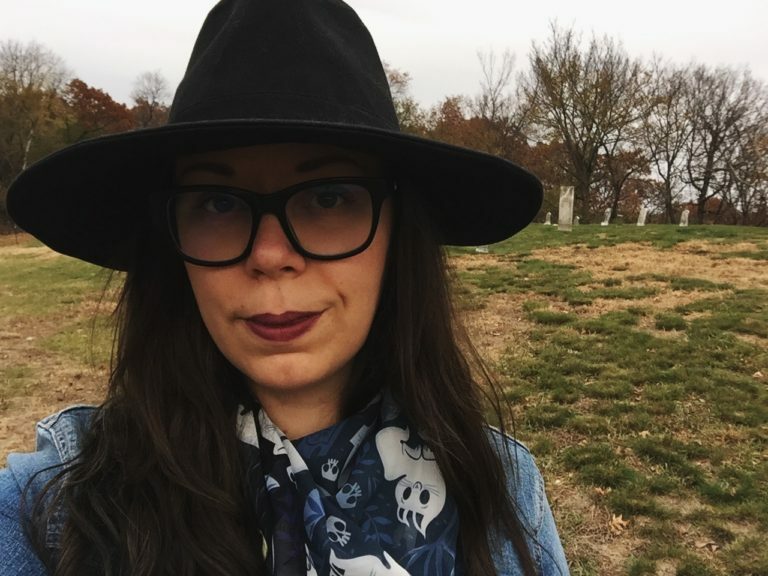 I’ve spent the last two years studying ancient funeral and burial customs, death lore, superstitions, and cemetery symbolism. In addition, I have a BA in English from the University of Iowa. I consider myself to be a shadow worker, a hedge rider, a witch of the in-between spaces. As both a lifelong student of mysticism & the occult and a devoted steward of nature, this path has required me to straddle the line between life and death, flesh and spirit, human and animal, natural and supernatural. I’ve come to acknowledge and accept that it is in these mysterious, liminal spaces that I feel most capable, most comfortable, and most at home. "Dawn is a deeply intuitive and spiritually connected being ... [she] is exceptionally empathic, and finds a way to connect not just with the persons (or animals) she is with, but with something deep and profound that runs through it all. I cannot recommend her enough." "Dawn has read cards for me several times and I'm always amazed by her accuracy and insight. Her interpretation of the cards seems to come very naturally ... Anyone can buy a deck of tarot cards and memorize their meaning, but Dawn's ability goes much further than those paper rectangles." "Since the first day we met, Dawn has been one of my go-to metaphysical experts. Dawn is acutely aware of human relationships to nature and animals, providing a sensitive and empathetic basis for her tarot." Folkloracle is a combination of the words “folklore” and “oracle.” It represents the alchemical magic that occurs when we connect with both our earthly ancestral roots and the higher spiritual energies swirling all around us. Folklore is the traditional beliefs, customs, and stories of a community, often passed through generations by word of mouth. It is a connection to the Earth and to our ancestors, both familial and spiritual. An oracle is a priest or priestess through whom prophecy was sought in classical antiquity; a medium who could speak for the gods, whose intuitive messages were often ambiguous or obscure, prompting the querent to seek Truth within. The word itself is symbolic of the mystical principle As above, so below. By tapping into the wisdom that occurs at the crossroads of these energies, we can learn to write our own stories and access our own magic inherent within. Connect with Folkloracle on Instagram @folkloracle.